Poroshenko and Stoltenberg discussed the situation in Donbass and Minsk agreements. 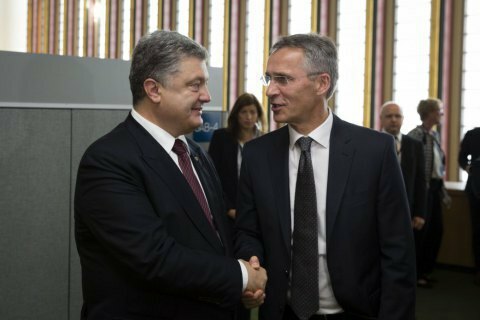 President Petro Poroshenko discussed the situation in Donbas with NATO Secretary General Jens Stoltenberg on the sidelines of the 71st session of the UN General Assembly in New York, the official site of the Ukrainian president reported on 22 September. Poroshenko stressed that sanctions against Russia should be continued until complete fulfilment of the Minsk agreements. Stoltenberg, in turn, confirmed that NATO supports Ukraine's stance on this issue. The interlocutors also discussed the further reform of the Ukrainian defense sector to achieve NATO standards. President of Ukraine thanked the Alliance for help in the treatment of Ukrainian soldiers. Poroshenko has called the NATO membership a strategic goal of Ukraine.